Sometimes it's hard to continue doing something that we don't see reaping immediate rewards. 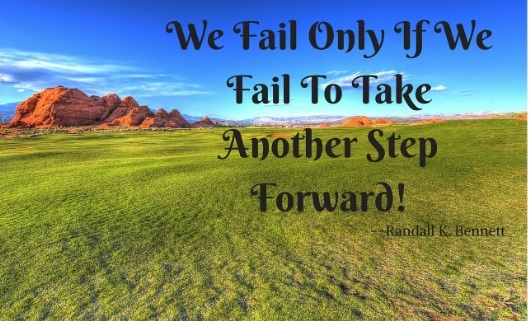 But know that as long as you continue to move forward, it isn't failure. Granted, sometimes one needs to step back, take stock, and possibly reinvent themselves or their strategy, but that counts as moving ahead, not failure! There are so many successful people who had, in their minds, abysmal fails at what they were trying to achieve. But they got back up and kept going! And eventually, their persistence paid off. Some well-known examples of initial failed attempts at success are Oprah Winfrey, Tina Fey, Arianna Huffington, Warren Buffet, Bill Gates, and so many others! Challenge: Find someone that you admire and do some digging about what their life really looked like before their success. Most likely you will find that the very things that challenged them or looked like failure, made them stronger! As for myself, I consider emerging out on the other side of winter only 7 pounds heavier than when I went into it a resounding victory! And that will spur me on to continue working on my health and wellness during the spring and summer months. What are your goals for this Spring? Is it health, organization, a project, relationship nurturing, or something else? Is the project you started currently out of commision? Don't worry, just dust it off and get started once again, if only just a tiny step forward!